After three weeks in Phnom Penh, I began to feel the very urgent need to flee the city’s constant cacophony of horns, the choking pollution, the routine of research/write/Tweet/repeat. 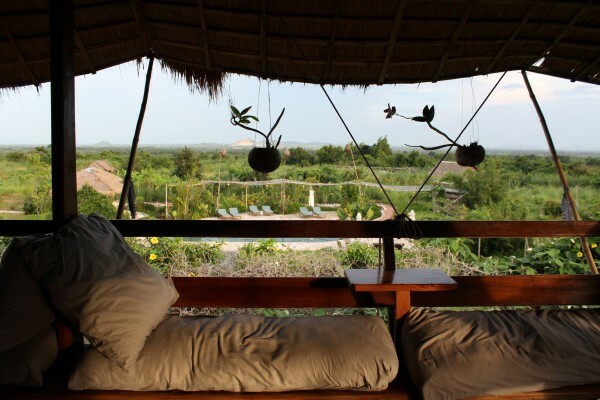 A friend had recommended a stay at The Vine Retreat, an eco-lodge tucked away in the rice paddies of calm, coastal Kep province. Coincidentally, a $10/night promotion popped up just as my laptop sputtered, protested weakly, then ultimately crashed. Technology agreed that I needed a break. So on the fly, I booked a few nights over the weekend and caught a bus to Kep, followed by a 30 minute tuk-tuk ride to the lodge. I arrived and instantly felt lighter. 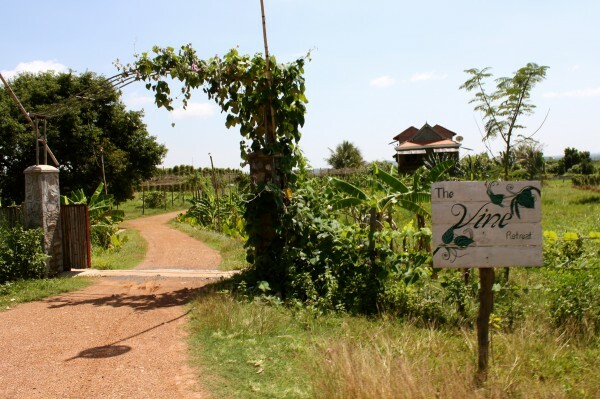 Constructed of mostly natural materials, The Vine has an off-grid, low-carbon electrical system powered by vegetable oil, as well as a solar water heater and a naturally filtered swimming pool. To the right was an organic vegetable farm, and to the left was a small plantation growing the famed Kampot pepper, widely regarded as one of the best in the world. With little to do but enjoy the landscape, I spent my days curled up on the balcony, reading Jeffrey Sachs’ The End of Poverty, drinking ginger tea and indulging in three-course organic dinners and homemade carrot cake. My one venture outside the lodge was a bike tour to the Women’s Handicraft and Development Association (WHADA) center in nearby Chamcar Bei village. 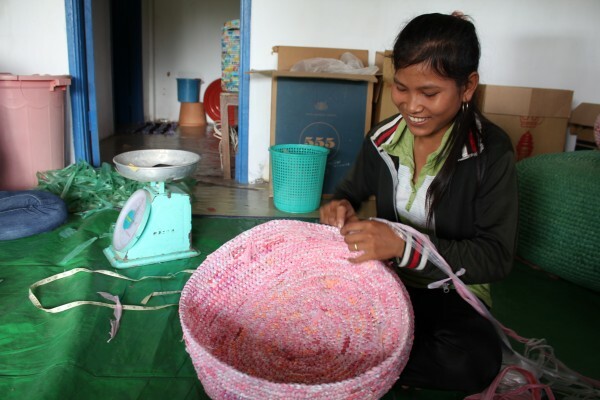 The center is a project of a local NGO called Bridges Across Borders, founded by the owner of The Vine, and it employs local villagers to create handwoven accessories, coconut jewelry, and housewares made from recycled plastic. It was Saturday, so the handicraft center was very quiet, except for a small group of women (and surprisingly, men) working on the recycled plastic project. They sat weaving plastic in a small room with a single fan, and my guide Cha explained to me that they were working overtime to fulfill an order from abroad. 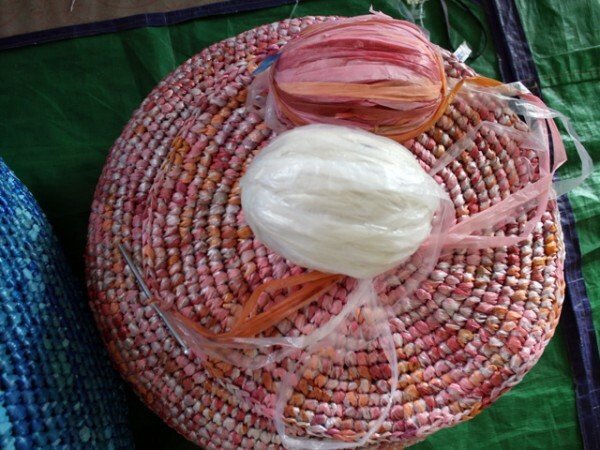 Discarded plastic bags are purchased in bulk from nearby Sihanoukville, transported to Chamcar Bei, then thoroughly washed and disinfected before they’re cut into strips and turned into woven handicrafts. The women were very sweet, and obviously curious about the solo female farang dripping sweat and taking photos of their workspace. But they seemed to be in good spirits, and Cha told me that they were earning $3 per day for their work… above the average wage for the region, but a number that still seems shockingly low to my Western sensibility. I was very much aware that my fancy camera had cost nearly a year’s wages; I felt embarrassed, and extraordinarily privileged. After a fair amount of smiling, nodding, and gesturing, we parted ways, and I spent the bike ride back to the lodge pondering questions of aid, NGOs, and economic development. Being in Cambodia has certainly tested my assumptions of what is needed in the global fight against poverty. My particular interest is in promoting craft-based social enterprises as a tool for economic development, but that is such a small piece of the puzzle. When I got back to the lodge, I returned to my balcony nook and resumed reading Sachs’ perspective on the issue. I also continued thinking about the best way I could contribute. Jessica Marati is a freelance writer and consultant particularly interested in social responsibility. This piece was originally posted on her blog, Tout Le Monde, which explores sustainable and ethical fashion projects in Southeast Asia.